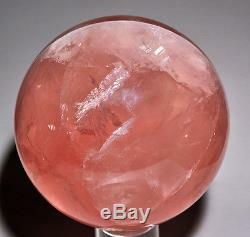 Rose Quartz 4.6 inch 5.25 lb Natural Crystal Sphere - Brazil. All of our crystals are natural and hand selected by our store owner, a 30 year GIA Graduate Gemologist. Crystalarium - True Gifts of the Earth. 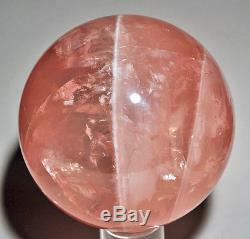 Cut from remarkably fine material, this breathtaking sphere is a deep and rich guava colored hue, with a clarity and saturation rarely found in Rose Quartz. Reflective veils meander, while a single, clearly delineated cloudy white plane strikes through the center of the succulent, translucent interior of this magnificent orb. 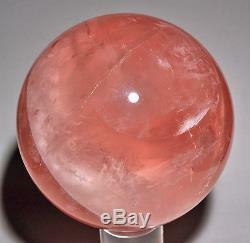 The item "Rose Quartz 4.6 inch 5.25 lb Natural Crystal Sphere Brazil" is in sale since Wednesday, November 16, 2016. This item is in the category "Collectibles\Rocks, Fossils & Minerals\Crystals & Mineral Specimens\Crystals".